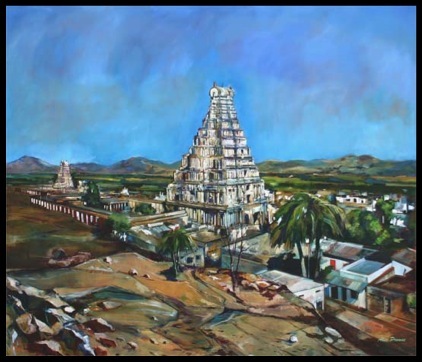 This group of Hampie paintings illustrates one of the least known episodes of Sathya Sai Baba's life story, but possibly one of the most revealing episodes of his early life. 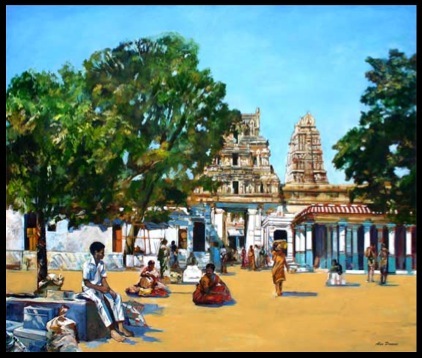 The paintings themselves are oil paint on stretched canvas and were painted at Chaitanya Jyoti Museum in Puttaparthi. The artist and his wife worked together to produce these three paintings, an unusual combined artistic effort. The research for the work was completed on location at Hampie. Painting number one begins the story, showing a bright and pleasant day, with a young boy sitting guarding the baggage. However, the scene is hiding the mysteries of what the participants in this story are witnessing in the inner temple. There is an older lady looking sharply at this young lad, Sathya Sai Baba Himself. The lady is in fact guarding the young boy and will not allow him out of her sight for even a second. Why, you may ask? Because she is a necessary part of this divine story: as she witnesses his presence outside, others in the temple are witnessing him appearing there at the same time. Although sent there by Baba’s doubting older brother, her testimony will later reveal that this bi-location is no mere trick, but a true miracle. Painting number two illustrates the grounds of the Temple, with its two large pyramid structures, one at the entrance and the other further up towards the back of the layout. The further structure houses Lord Virupaksha’s Inner Temple, where, mysteriously, a Golden Mask hides the Lord Virupaksha Lingam (a dome stone) which is only shown during special pujas or mystical events. Whilst attending one of these events, the Golden Mask was lifted and the Lingum was shown to the small group of onlookers, including the artist. To the astonishment of the artist, a picture of Sathya Sai Baba flickered on the Lingam. The image was not of the mature Baba who they had recently left at Prasanthi, but of Sathya Sai Baba as a boy of about the age He would have been during this miraculous event. This likeness can be seen included in the painting to document it, but which, for ease of illustration, has been placed above the Golden Mask. 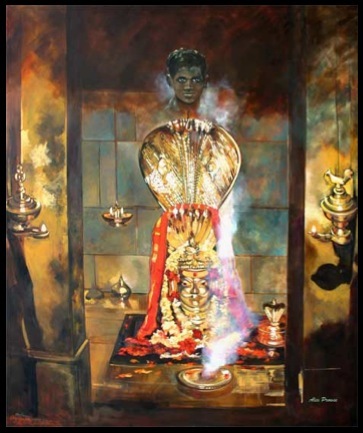 Painting number three also shows the lighted lamps and the Golden Mask of Lord Virupaksha. The sanctum sanctorum is a cool, damp place. It is a rare and exotic sight: the hooded cobra guarding the Mask. Further seeing the ghostly image of Sathya Sai Baba must have been a shock for the original participants in the story.